Today is Frida Kahlo’s birthday. 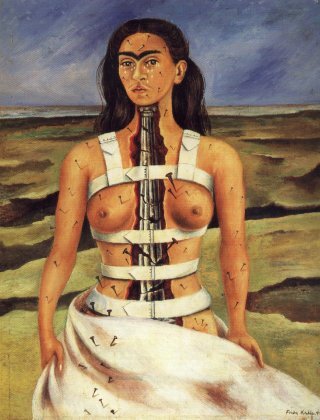 In honor of her and her work, I took time to sit, breathe and reflect on Frida and all that her work has meant to me. I often think about Frida and what it means to recognize each other, as disabled queer women of color. I don’t know if Frida would have described herself as “disabled;” if she would have even used that language, that thinking. Would she have thought of herself as what we understand as “queer,” using whatever language and words she chose around her open bisexuality? I don’t know. I found Frida when I was young, and it seems I have been continuing to find her my whole life. Frida was originally introduced to me when I was a young teenager as a feminist symbol; as a “strong woman of color artist.” As one of the few non-black woman of color thrown in amongst majority white women, I remembered her. It was only later that I found out she, like me, had polio as a child and about her bisexuality. 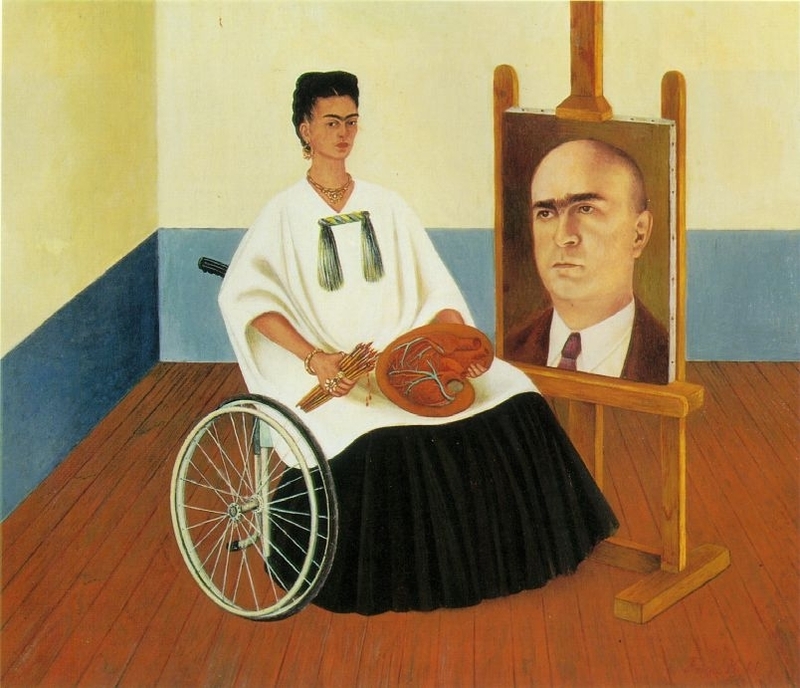 For me, Frida was a symbol of one of the few disabled queer women of color that I knew of. Her paintings conveyed things beyond words about bodies, death and pain at a time before I had the tools and language with which to talk about disability, surgeries, legs, spines, backs, pain, womanhood, suicide, shame, desire and self-hate. She was a necessary reflection of parts of me when I felt so alone, cut-off, isolated and like a freak. 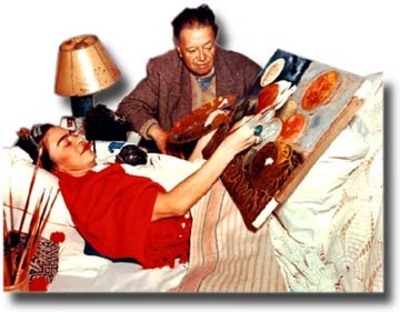 Her paintings were some of the only visual images of disabled women of color that I had, period. And the fact that she was painting herself and deciding how she wanted to be seen and understood was even more powerful. Frida helped me to recognize pieces of myself and for that I will forever be grateful. To me, Frida was descriptively disabled and queer, even though she may not (or may) have identified as such or used that language. When I say “descriptively disabled”, I mean someone who has the lived experience of being disabled. They may not talk about ableism, discrimination or even call them selves “disabled,” but they know what it feels like to use a wheelchair, experience chronic pain, have people stare at you, be institutionalized, walk with a brace, be isolated, etc. There are many people who are descriptively disabled who never become or identify as “politically disabled.” When I say “politically disabled,” I mean someone who is descriptively disabled and has a political understanding about that lived experience. I mean someone who has an analysis about ableism, power, privilege, who feels connected to and is in solidarity with other disabled people (regardless of whatever language you use). I mean someone who thinks of disability as a political identity/experience, grounded in their descriptive lived experience. (The same is true for descriptively queer, descriptively woman of color, descriptively adoptee and so on.) I don’t know if Frida was politically disabled or queer. This distinction is helpful for me, because the majority of the disabled women of color (especially disabled queer women of color) I meet are descriptively disabled, not politically disabled, as was I for a long time. Or they are descriptively queer, not politically queer. The risk of having to begin to have conversations about ableism, access and power in our families, with our caregivers, attendants, co-workers, friends and lovers is tremendous, often times threatening the very delicate web of access we’ve managed to create—threatening our very survival. How do you talk about queerness when it is assumed you have no sexuality as a disabled person, while simultaneously you are washed with racist gender stereotypes about women of color’s desire and sexuality? What does it mean to be stripped of our sexuality at the same time we are hypersexualized at the same time that we are infantilized at the same time that it is assumed we will shoulder the brunt of the work? There is great risk in visibility. And even when we are visible as disabled queer women of color, sometimes we don’t even recognize each other. We don’t recognize each other because we’re not taught how to do it; because we’re taught how to be afraid of each other. Because we are taught how to not recognize each other more readily than we are taught how to find each other. Where are we? How do we find each other? And how do we do the work to recognize each other and to be recognizable to each other? Sometimes, as is so often the case with queerness (and disability), I see you, but I don’t know if you see me. I feel this acutely with adoptees. We share space together, but often times we don’t know how to recognize each other. We look right through one another, or avoid each other as if we were taught some kind of secret script. I wonder about Frida and my recognition of her and if she would have recognized me. I want you to recognize me. And I want to leave evidence about how I made myself recognizable to you (for you) and about how I tried to find you—to make it easier for the next time we are faced with ourselves/each other. Because there were so many times I chose not to recognize myself inside of me as well—there were times I avoided pieces of myself. We can learn how to recognize each other. We can teach each other. We must practice recognizing each other. And we need as many visible queer disabled women of color as possible to help us get there. As many of us who are living our lives and are able to leave trails and stories about the way we felt, looked, moved, survived and created. As many of us who refuse to let our disabled queer struggles get subsumed by the able bodied queer movement as only queer; who refuse to let our disabled people of color stories get subsumed by the white disability movement as only disabled; who refuse to be invisible, for the sake of each other. As many of us who are cultivating the elder in us all to be here (in whatever way we can) for those who come after us, because we need them and they will need us. So, today, on Frida Kahlo’s birthday, I sit in gratitude for her paintings. They were an avenue of recognition for me. They were a way for me to recognize pieces of her, and in turn, a way to recognize pieces of my self, and allow me to recognize others. I thank her for her life and her honesty and all of the complexities she holds. Thank you. Thank you for such a beautiful, honest, amazing post. Thank you so, so much. I, too, am a Frida Kahlo gratitude-r. I have followed her work and her story for years, and feel connected to her in some way that’s important to me. So I fully understand where you are coming from …. a wonderful, timely post. Thank you. Thank you for helping me recognize Frida Kahlo in new ways. It’s startling to see with new eyes these familiar images, and to feel again the reverberations of her militant radical politics. Your words were amazing. Thank you for connecting them in such a way and sharing. Gracias for this Mia. It’s really causing me to be self-reflective. I can’t believe I missed this. Mia, thank you so much. This is just what I needed to hear- especially the part about the risks of naming and claiming a political identity as a disabled queer person of color. Your words give me so much strength. Let’s keep practicing recognizing each other. Thank you for this post, it was a pleasure to read. I never thought about “queer disabled woman of color” as a single identity. As someone who may very well fit this description, it’s refreshing and empowering to hear it referred to as such. Your points about invisibility and recognizing each other were well made and resonated deeply with me. The experience of invisibility is embedded within my lived experience on so many levels, as bisexual, as a genderqueer person who passes as a ciswoman, and as a chronically ill person with an invisible disease that no one can see and no doctor would diagnose me with (one which bears suspicious resemblance to all the symptoms of CFS). This invisibility has been such a huge part of my life that it took me years to find some of these words (bisexual, genderqueer, disabled, person of color) and identify with them despite my constant lived experiences. The difference you make between descriptive identities and political identities is important and explains a lot. Thank you. I was troubled by one thing, which you might not have meant, but I’ll point it out anyway: after you write about Frida’s (descriptive) bisexuality, you contrast it with (political) queerness in a way that seems to dismiss the option of political bisexuality. I just wanted to mention that that option is there, and that bisexuality can be a radical, subversive and highly political identity.